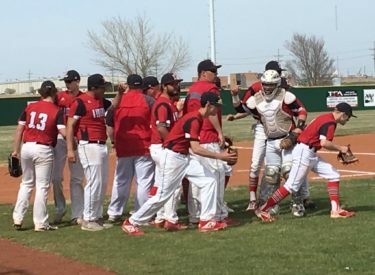 The Liberal Redskins and Great Bend Panthers split a double header on a warm and windy Friday afternoon and evening at the National Beef Family Sports Complex. Both teams rallied to win. The Panthers won the first game 8-3 and the Redskins won game two 8-5. In game one, James Armstrong pitched very well going five innings allowing just one run on two hits. The Redskins took an early 2-0 lead. Pancho Terrazas doubled home a run and Liberal scored another run on one of the three Great Bend errors. The Redskins took a 3-0 lead when Braxton Hyde launched a homer over the left field wall to lead off the fourth . Great Bend scored one in the fifth to make it 3-1. The Panthers’ Jesus Bujanda changed the game with a three run homer to left center in the sixth to make it 4-3. Great Bend added four runs in the seventh . In game two, Great Bend took the early lead with three in the first against Redskin starter Braxton Hyde. None of the runs were earned. Javier Bojorquez doubled home a run in the Redskin second to make it 3-1. Great Bend’s Townsend Kurth hit an inside the park homer to center in the third to give the Panthers a 4-1 lead. Liberal bats came alive for the first time all season in the third. Rodney Pando began the rally with an infield single. Elijah McCarter then singled. Syris Dunlap tripled over the right fielder to score two and make it 4-3. Pancho Terrazas singled him home. Bojorquez punched a two out single through the right side to give the Skins a 5-4 lead. LHS added two in the fourth. McCarter ripped a triple to left and to score a run and scored on a Dunlap sac fly. McCarter tripled home a run in the sixth for insurance. Hyde went four innings allowing one earned run with five strikeouts and no walks. Kye Purdy pitched three innings allowing one run. McCarter was 3-4 with two triples, two RBI’s, and two runs in the win. The Redskins are 5-2 and 1-1 in the WAC while the Panthers are 4-4 and 1-1. Liberal hosts Dodge City Tuesday night at 6 for senior night. The game airs on 1270 and kscbnews.net.